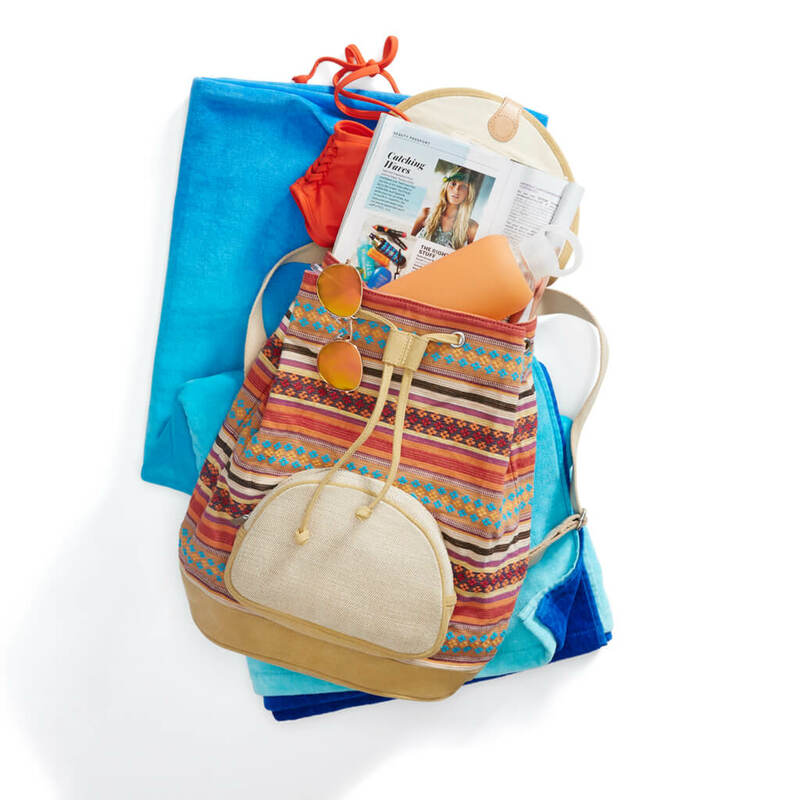 Sure, swimsuit cover-ups and stylish beach bags are necessities of summertime, but we say splurge on something that can give you more (style) mileage. This year, get creative with pieces already in your closet and bags that can play double-duty. Well, water you waiting for? From beachside hangouts to poolside parties, make a splash with these five tips for all you water babies. Open-knit cardigans are a closet staple for seasonal transitions, so why not wear them all year? They’re a must-have for layering, and some are light enough to wear when it’s hot. The added bonus? They’ll shield your shoulders from the scorching sun. Wear one over your swimsuit during the day, then float seamlessly into an evening soirée. Stylist Tip: If the thought of covering up in a sweater is too much, try a kimono instead. The right accessories make all the difference. Don’t drag your look down with a heavy leather carry-all, opt for natural fabrics like canvas—that you can still use off the beach. 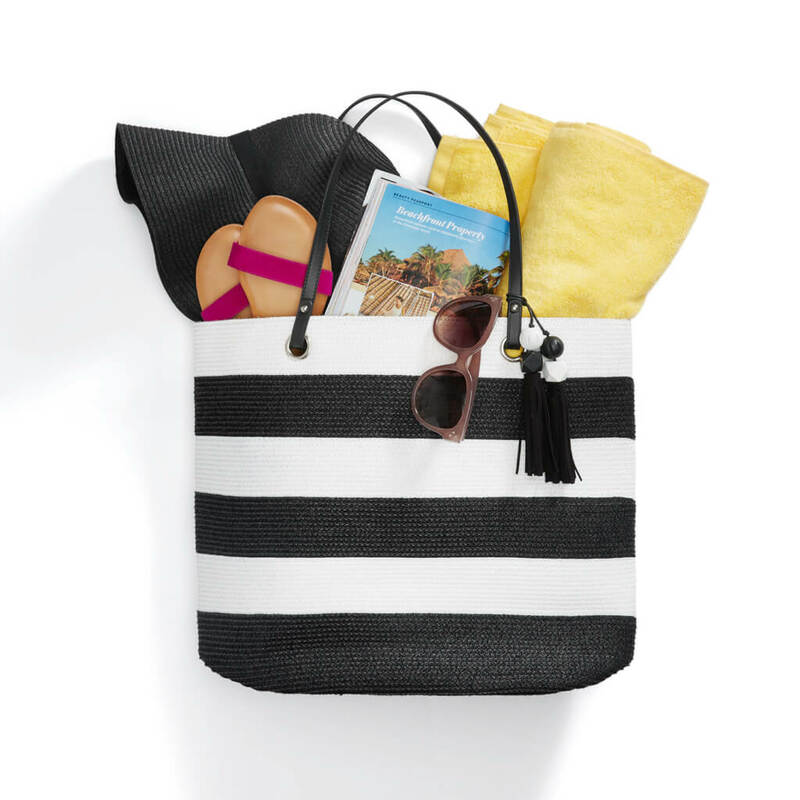 Get even more bang from your buck with a bag in a neutral pattern or color, like black, white or navy. Stylist Tip: A straw hat is not only practical, it’s easily packable! Gently fold the brims of the hat inward and place on top of your poolside essentials. Last minute pool party? Grab a button-up in cotton or linen top as you head out the door. They’re easy to wash and can get you from beach to bar stool in a jiff. Try one in a playful print, like plaid, stripes or gingham, paired with your go-to denim shorts. Tie the bottom ends of the shirt together for a retro-inspired vibe. School’s out, but backpacks are in! Keep your hands free for while you trek to-and-from the car with beach towels, umbrellas and coolers in stow. Keep things organized by placing smaller items—like sunblock, hair accessories and tech supplies (don’t forget the earbuds and phone charger) in small cosmetic pouches. Stylist Tip: Make your backpack one of a kind! Collect pins from places you’ve been and give your rucksack a dash of #tbt style. Stripes for summer? Groundbreaking. This print is a seasonal favorite because of its nautical feel and versatility. We recommend pairing this classic with a pop of color! Try a tunic or dress—or throw on a tank with high-waisted shorts—and don’t forget a denim jacket for when the sun goes down. Do you have any poolside style tips? Let us know in the comments below!